Adele covers British Vogue's October 2011 issue. Vogue's March issue is traditionally a very big one for the glossy: It's the magazine's big spring trend special, and has in the past featured cover stars like Lady Gaga. This year, a new report indicates Vogue may have a musical cover star in mind again: British songstress Adele. According to WWD, the magazine has been asking designers to create custom outfits for the curvy star that might be featured on the glossy's cover. Adele is a U.S. size 14 (or a U.K. size 16), so she -- like most people -- wouldn't be able to wear a sample garment from a label, considering runway samples and showroom samples are typically sized for models in the 0-4 range. 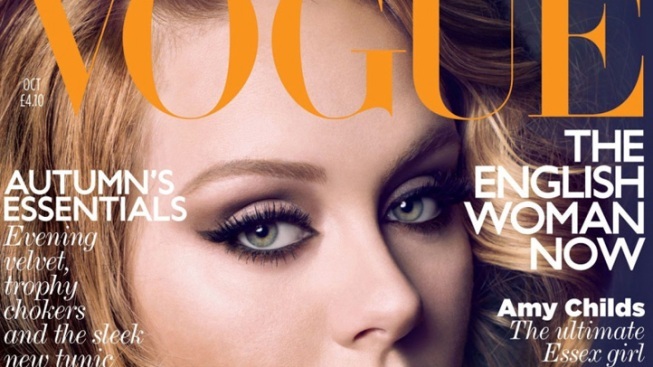 Adele has been featured on prominent covers this year as a result of her blockbuster album, "21," including Vogue UK in October and Cosmopolitan in December, but landing American Vogue would be quite a feat. Considering the star's popularity in both music and fashion circles, we're hopeful that the rumor turns out to be true. On the other hand, however, Stylelite recently reported that the Vogue was calling in samples for Taylor Swift, who was also invited by Anna Wintour herself to sit front row at the Rodarte Spring 2012 show next to her and Rooney Mara, who also landed a Vogue cover. Granted, magazines like Vogue are often known to call in samples for major stars that will be featured in an issue, while not necessarily on the cover, so it's possible that both Adele and Swift will appear in the March issue regardless of which ultimately lands the cover. Wintour, like most editors-in-chief, may also be waiting to see how the shoots themselves turn out before making a final decision. When a magazine has as much clout as Vogue does, one can afford to be choosy.